It was only a few weeks ago that a friend of mine posted something on Facebook: “Just made jam from the plums in my garden, gotta love the fruits of the autumn!” (or something along those lines, my Swedish is still a bit shaky). I immediately replied, of course: “As long as the trees are still green, it is summer, I don’t care how cold it’s getting or how much fruit/mushrooms/nuts you collect!” (again, that was the intended message, whether the Swedish I threw together meant the same remains an open question). But then autumn-themed posts appeared in my feed. And the trees actually started changing color (well… the leafs did). And I knew… there’s no denying it any longer. 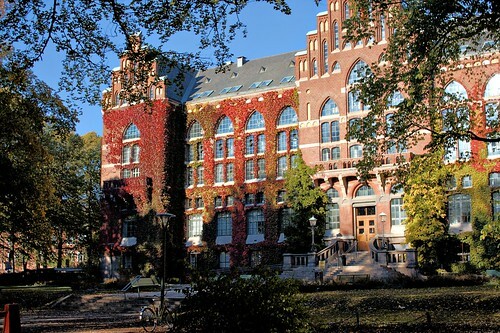 Lund University Library in autumn. Photo by JanneM via Flickr. It’s not like I have anything against autumn in particular. I don’t. I don’t have anything against any season. I don’t really have anything for any season either though, to be honest – the concept of a ‘favorite season’ is kind of alien to me. No – what I like most about seasons is the mere fact that they’re there. I would hate to live in a country which has summer all year round, or even only two seasons. It’s the changing of the seasons, the continuous dynamic of that vicious circle that keeps things interesting. I love the freshness of the green in spring, I love the abundance and smells of summer, I love the colors and tastes of autumn, and I love the serenity and quiet of winter. Granted, I generally long for one season when another one is still going on, but I’m working on that. Still, this year, I’m not exactly looking forward to the changing of seasons. Autumn is not too bad, I guess, although a few extra degrees would never hurt, but the really bad part about autumn is that it is so, so close to winter. And I just. don’t. feel. like. winter. Don’t get me wrong – wrapped in a fleece blanket, hot chocolate, coziness by the fire place, snow walks (I REALLY need to lose my snow angel-virginity this year), skiing: I get it, it’s great, it’s wonderful. But winter also means: dark. And here in Sweden, even though I can’t really complain as I’m as southern as it gets, there’s an awful lot of dark: at the winter solstice, the shortest day is around 7 hours long – or short, as you prefer – with the sun setting around 14h40. Last year I minimized the effects of this: objectively, Ghent only gets half an hour of daylight more, so that’s not too big of a deal, is it? But, since Ghent is not only located more south, but also more west, this translates in a Ghent sunset over a full hour later. And last year that mere hour of difference induced a full-on winter depression for me. So no, I’m not really thrilled about the leafs falling and the temperatures dropping, the nights getting darker and the birds moving south. I know (better) what I’m up against this year, so I know what signs to look out for but still… I’m not looking forward to it.